For the latest international news, please visit our new blog site. For country-specific information, statistics, and reports, please visit our Restricted Nations page and select your country of interest. Thank you to our many subscribers and regular visitors. 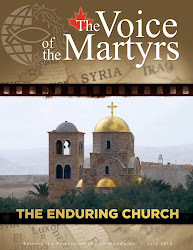 The Voice of the Martyrs Canada is a non-profit organization that raises awareness and support for persecuted Christians around the world. Here, you'll read stories and commentary about the Persecuted Church and ways that you can get involved in serving suffering believers. Sign up for a free subscription! © 2012 The Voice of the Martyrs, Canada. Simple theme. Powered by Blogger.